Today we’re going to talk about power steering service in Mission Viejo. If you took an informal poll around Mission Viejo you’d probably find that most have never heard of power steering service. That’s not surprising. Even though power steering is standard on every vehicle, most people in Mission Viejo aren’t aware that it needs periodic service. Without power steering, your arms have to do all the work to steer the wheels, and that’s hard, especially around downtown Mission Viejo. That’s why old cars had such big steering wheels; to get enough leverage to steer. Most vehicles in Mission Viejo have a hydraulic power steering system. The serpentine belt from the engine powers a pump. The pump pressurizes the power steering fluid. This actuates a hydraulic cylinder that provides power to help steer. Some vehicles in Mission Viejo use an electric pump to pressurize the fluid rather than a belt driven pump. We’re also seeing vehicles with electric motors providing the power assist, not using power steering fluid at all. We’ll see a lot more electric systems as more hybrids and electric vehicles hit the market. So ask your Mission Viejo service advisor at Autobahn West or check your owner’s manual to see when power steering service is recommended. It’ll extend the life of your power steering components. Virtually all vehicles come with power steering so many Mission Viejo motorists have never driven a car or truck without it. Power steering assists you when you turn your pickup steering wheel. Without it, it would be very hard to steer. Now this power assist comes in a couple of forms. 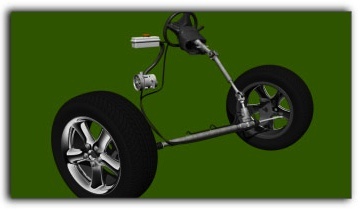 In recent years, a lot of Irvine vehicles have an electric motor that reduces steering effort and helps improve gas mileage. The other kind of power steering is hydraulic. This is the kind most older CA vehicles, and a lot of newer ones, have. Power steering fluid is pressurized by a pump and is used to assist steering. Of course, Irvine car owners need the right amount of fluid in the system. If it’s too low your steering is affected and you could damage your pickup pump. Also, power steering fluid can become corrosive over time and damage the pump, hoses and connectors; leading to leaks and repairs. Power steering service at Autobahn West in Mission Viejo includes removing the contaminated fluid and replacing it with fresh fluid. A word for Mission Viejo car owners about power steering pumps: Some are powered by an electric motor. Others are driven by the serpentine belt. A worn serpentine belt stresses all of the pickup components it drives, including the power steering pump, so replace the belt at Autobahn West as advised to avoid undue repairs. Losing your power steering while driving in Mission Viejo can be unsettling – just remember that you can still steer, it’ll just be harder. Check with your understanding Autobahn West service specialist to see if it’s time to service your pickup power steering system. In addition to power steering service, at Autobahn West we offer comprehensive automotive services including cabin air filter, windshield wipers and power brake service.